On the evening of March 6 I went by myself to hear Bobby Kennedy Jr speak at Queens University of Charlotte. I was hoping I might somehow be able to hand him a copy of our Going Green manuscript, so he might write a short endorsement for the jacket of the book. Our book does address the environmental impact of factory farming, which is one of Kennedy's pet peeves. I didn't know specifically what Kennedy planned to talk about at Queens, except that it would involve the environment. I didn't really want to go out alone; I was tired. I told my friend Beth that I didn't think he would say a lot I didn't already know. But it turned out I was wrong. It's true that the general gist of his talk wasn't new to me. If you've seen the documentary "The Corporation" and the video "The Story of Stuff," then you know that corporate America is entirely focused on making profits for shareholders, and that any other considerations are a distant second, regardless of whatever greenwashing comes from their marketing departments. "The Story of Stuff" makes the point that our corporate production model is "linear" and cannot function long in a world with finite resources. It's linear in that we extract raw materials, use them up and dispose of them and their by-products recklessly, rather than recycling them. Kennedy's talk incorporated these familiar points. But, for me, he put flesh on these ideas and somehow inspired me as few speakers ever have. As an environmental lawyer, and head of Pace Law School's Environmental Clinic, he has spent his adult life suing corporations that pollute, fighting them in court - he has seen their ugliest tactics. He understands the whole frightening picture inside and out. Here's some of what he said. First of all he underscored the message in "The Corporation." He said that "corporations' only obligations are to their shareholders." This obligation drives a "revolving door of plunder." Our government allows corporations to keep all the profits of their plunder, but they are not held responsible for the long-term costs of their exploitive production methods. The public is left with the clean-up costs. "Good environmental policy is identical to good economic policy," Kennedy said. A sustainable economic policy would force corporations to internalize the long-term costs of their damage to the environment and communities and labor. But corporations are allowed to exploit and degrade nature because they use campaigns and lobbyists to get their hooks into the federal government. Kennedy talked about the Bush administration's 400 rollbacks of environmental progress that had been made over the last few decades. The rollbacks, he said, are listed on the NRDC website. In his talk, he cited case after case of industry honchos whose "other career" is safeguarding the very resources their industry exploits and destroys. For example, Philip Cooney was the head of the Council on Environmental Quality for the Bush administration until a couple of years ago. But before that, he was the chief lobbyist for the American Petroleum Institute. Another example: the head of the U.S. Forest Service was previously a timber industry executive. Kennedy called this "crony capitalism." The Bush government allows the fox to guard the henhouse, again and again. Kennedy's theme was "the subversion of American democracy" by corporations with excessive power. Why do we as Americans passively permit this to happen? Kennedy said that five corporations control all radio, all TV, and 80% of American newspapers. "Americans," he said, "are the best entertained and the least informed population in the world." He quoted Thomas Jefferson, who said you can't have a democracy for very long with a public that is uninformed. 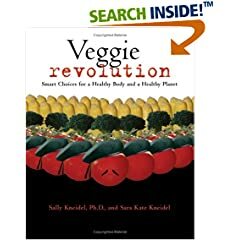 A couple of things surprised me about Kennedy's talk. He loves our country, and he said partisanship is not constructive. He said he is not an environmentalist, rather he is a free-marketeer who pursues the cheaters - the corporations who damage our natural resources and leave the mess for others to deal with. He said nature is the unifying theme of American culture, and he backed this up convincingly. 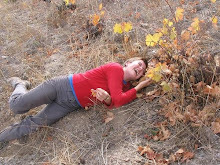 He tied in his spirituality, too, saying that wilderness is the undiluted work of the creator. He talked with warmth about fishing and camping with his sons. Wilderness is the way God communicates with us most forcefully, he said, "with clarity and texture". His speech was beyond moving. If I was a person who cries easily, I would have been weeping. Instead I just had to marvel at the case he made for our wild lands and our clean water and our health. They are everything - not only our cultural heritage and our spiritual connection, but our social foundation. "We fight for the fish and the birds because it's the infrastructure of our community," said Kennedy. Nature and our natural resources are our history, and everything we need for the future. I didn't get to talk to Kennedy, and I suppose he won't write a jacket blurb for this book, as he kindly did for my last one. But I am a wiser person for having heard him. What a mistake it would have been to stay at home. Caption: Color-coded footprints indicate the dollar cost, in trillions, of environmental damage inflicted by high-, middle-, and low-income groups of nations on each of the other two groups. So, what about all those loans we've made to impoverished nations over the years? Poor countries have borrowed a whopping $1.8 trillion from rich nations like the United States, Japan, and European Nations. When are those pikers gonna pay up? As it turns out....they may not need to. In fact, by recent reckonings, we should be paying them. Our debt to developing nations, from the environmental damage we've done, now outweighs the total that poor countries have borrowed. During the last 4 decades of the 20th century, rich nations caused up to $2.5 trillion in environmental impacts on poor countries. Surprisingly, middle income nations such as China and Brazil did about the same amount of damage to the lowest income countries, such as Bangladesh, India, and Nigeria, as the richest nations did. Researchers at the Pacific Ecoinformatics and Computational Lab in Berkeley, Calif., identified several categories of environmental damages, including climate change, deforestation, and overfishing. Rich nations are disproportionately responsible for these damages even inside the borders of the poorer countries. For example, timber corporations in the U.S., Japan, and Europe are the primary drivers of deforestation all over the tropics, in places such as southeast Asia and South America. We also lead the world in greenhouse-gas emissions (China and the U.S. are #1 and #2). The resulting climate change is causing droughts and floods that are devastating to developing nations with agrarian economies, which applies to most of the poorest nations. Although patterns of consumption and waste in rich nations are responsible for environmental crises worldwide, the poorer nations will bear the brunt of resource depletion and alterations in rainfall. Lacking the financial resources of the industrialized world, and the options provided by wealth, they will feel the impact of diminishing resources more keenly than the perpetrators. Says Boris Worm, a marine biologist at Dalhousie University in Halifax, Nova Scotia, "The injustice inherent in the current environmental crisis may well exacerbate the divide between rich and poor." An understatement, perhaps. Source: Susan Milius. 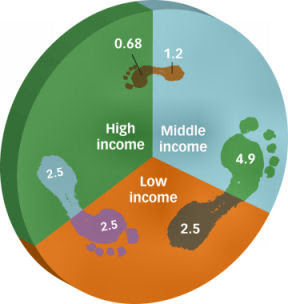 "Big Foot: Eco-footprints of rich dwarf poor nations' debt." Science News. January 26, 2008. Vol. 173. 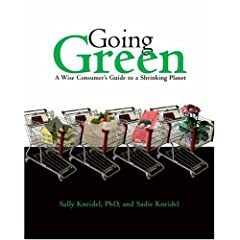 1. our upcoming book (Going Green) about the environmental impacts of Americans' consumption patterns, and how choosy consumers can make a difference. 2. our previous post on our visit to a remote African village, where we learned that the villagers hold Americans responsible (rightly so) for the diminishing rainfall that is changing their lifestyle. Daylight Savings Time. Man, what a bummer! Folks who are excited about the extra hour in the evening clearly don’t get up before 8 AM, or they’d be singing a different tune. DST’s timing is bitter. My morning rides have been unbelievably exquisite lately. Last Thursday – pre-DST - was one of the best rides I’ve had yet. Heading out of town, for the first time this spring I heard a familiar and magical sound: of hundreds of thumbs tweaking the tines of hundreds of plastic combs. 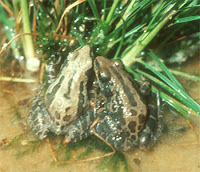 Chorus frogs! The perennial sound of spring, of hope peeping out of warm and marshy puddles. That afternoon my ride home took a long time. Every time I worked up a good speed, I’d spy yet another field of daffodils and have to stop and pick them. Our kitchen table is covered with jam jars of flowers now. It’s beautiful, but hard to eat breakfast. Today, though, was another story. When my alarm went off at 6:30, it was pitch black outside. Black as night – because it WAS night! Time to start keeping track of the sunrise again. Tomorrow, 7:35. Sigh. Greensboro has wisely chosen my morale slump as the perfect time to announce the Triad Commute Challenge. I’m not sure if this is a cause or an effect of our inclusion in Popular Science’s list of >50 Greenest Cities, but it’s definitely a good idea. The dare is modest – participants are challenged to try an alternative commute just once by the end of May. Biking, walking, carpooling, riding the bus, even telecommuting – there are lots of options. It’s not much, but it’s nice at least to see the city recognizing that reducing car traffic is a good idea. And, sadly, that idea probably is a stretch for a lot of people. But hey, biking was once an impossibility for me, and look at me now! I've had enough of George Bush and his systematic un-doing of the environmental legislation enacted by the Clinton administration. I'm terrified at the prospect of another president who places corporate interests far above citizens' interests and way way way ahead of environmental interests. I want a democrat yes, but this election has much more at stake then that. Our country will take a giant step forward, culturally and politically, if we can elect anyone who isn't a white male. We've had 43 white males in a row as president. Right now, the ideal candidate would be a non-white female. But since that's not one of the choices, democratic voters will be choosing between a black male and a white woman to run against McCain. I like Obama. What's not to like? He is reminiscent of the idealism and romance of the Kennedys, as everybody says. 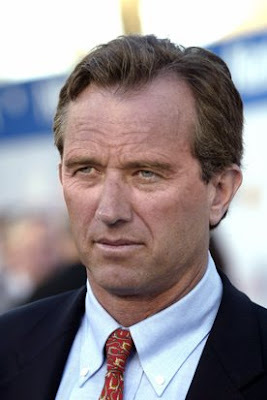 I have loved the Kennedys since I was a kid, and I still do greatly admire RFK Jr's prolific record of environmental accomplishments. When he wrote an endorsement for the jacket of our last book, I was so proud. But....how can I not root for a candidate who is the first representative of my own gender to ever be a serious contender for the office of president? 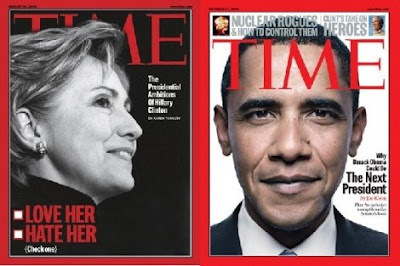 I pretended for awhile to weigh the merits of Obama and Hillary intellectually, and then one day, in one moment, it became crystal clear. I could never vote against Hillary. To do so, for me, would be a vote against women, against my own gender. Against this extraordinary chance that may not come for another 100 years. If Hillary were not a woman, she would have bagged this nomination long ago. In a country still beset by gender and race stereotypes, which one is more of a liability? "Gender stereotypes trump race stereotypes in every social science test," says Alice Eagly, a psychology professor at Northwestern University. Bias researchers such as Eagly have found that racial bias is strikingly changeable, and can be mitigated and even erased by everything from clothing and speech cadence to setting and skin tone. Professor Eagly says that attitudes about women are harder to change. Clinton's campaign has discovered for themselves that gender stereotypes are less changeable. Women can be seen as either ambitious and capable, or they can be seen as likable, but it's very unlikely for them to be seen as both. "The deal is that women generally fall into two alternatives: they are seen as either nice but stupid, or smart but mean", said Susan Fiske, a psychology professor at Princeton who specializes in stereotyping. Although racial attitutes appear to be softening, there's little evidence that gender biases are. Amy Cuddy, a psychologist at Northwestern, suggests the durability of gender stereotypes stems from the fact that most people have more exposure to people of the opposite gender than to people of other races. They feel more entitled to their attitudes about gender. "Contact doesn't undermine these stereotypes and it might even strengthen them," says Cuddy. "Many people don't believe seeing women as kind or soft is a stereotype. They're not going to question it because they believe it's a good thing." Is it a good thing? Kindness and softness are good things in both men and women. But it's not a good thing to hold a candidate to impossible standards. I hear women I know talking about how mean or cold Hillary is, how much they "hate" her. Is she meaner or colder than George Bush or John McCain or Barack Obama or any other male candidate? Hardly. We want her to be momma and the general at the same time. It's the hardest task any candidate has ever faced. But some woman, some time, will have to break through and create a new precedent for female presidential candidates in the future. Most female heads of state around the world have had a family member who preceded them in office. We know that. That much precedent has already been created. Now is the time we can pop that glass ceiling. We're almost there! If not now, how much longer will it be until another opportunity arises? I believe Hillary's presidency would profoundly change the status of women in this country. I for one am on-fire ready for that. How bout you? Drake Bennett. Feb 19 2008. Gender vs. Race: Historic race may show biases of the American mind at work. The Boston Globe. Tourism is one of Kenya’s biggest industries, but the violence that exploded after a flawed election in December has eviscerated the business, with bookings down 80 to 90 percent in most areas. Even after a peace deal was signed Thursday, government and tourism officials worried that it could take months — if not years — to recover. Kenya’s rival politicians have agreed to share power, and on Friday many people here praised them for finally calming the country down. But the long-term economic consequences are just beginning to sink in. “We will work very hard to see what we can salvage,” said Rose Musonye Kwena, an official at the Kenya Tourist Board, who estimated that even if there was no more major violence this year business would still be down 50 percent. To read more, click here.To see a video from the NY Times, click on the video link below. Source: Jeffrey Gettleman. March 1, 2008. As Kenya bleeds, tourism also suffers. New York Times.